The Peace Corner Youth Center (PCYC) is a non-profit organization in the Austin neighborhood on Chicago's West Side. It was created to provide the neighborhood youth a safe place from gang violence and drug dealing. Founded in 2002 by Father Maurizio Binaghi, The Peace Corner offers community youth summer and after-school programs, including activities like basketball, academic tutoring, and using the computers. More than anything else, it offers kids an opportunity to escape the criminal activities on the streets outside, and allows them to forget being in “survival mode,” said The Peace Corner’s executive director, Steven Hartley. He said the center also teaches them the concept of respect. For more, visit our Muckrakers blog. The center is in a LEED-certified, green building on Madison Street. It has a computer lab, a fully equipped classroom, a regulation basketball court and a pool table. Sebastian Longstreet is a youth supervisor at PCYC. The 21-year-old grew up in the Austin community where he started off as a volunteer and many young kids look up to him as a role model. 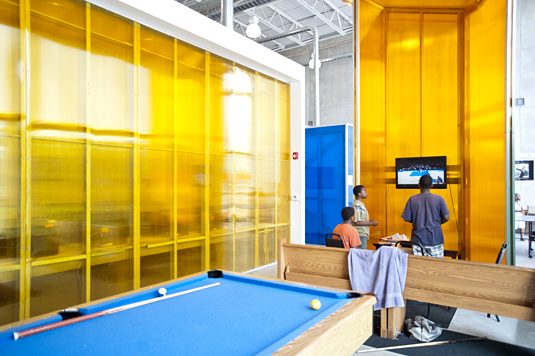 The Peace Corner offers community youth summer and after-school programs, including basketball, academic tutoring and a computer lab.